From China to Europe per train in 12 to 14 days; it is possible when the entry gate is Finland, and the terminal to arrive the Railgate Finland in Kouvala. Finland has the same broad gauge as the CIS states, so the train only needs to switch to another railway network once, instead of twice”, Aleksandra Turunen said. Turunen is Account Manager at Kouvola Innovation Oy and will be speaking at the RailFreight Summit in Gdansk, which takes place on 15 and 16 May. Here, she will present the huge opportunities to the Nordic and also to the Central European market, as the terminal is currently expanding its profile. 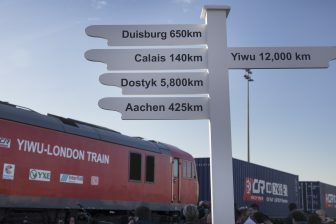 While most European countries are gradually preparing the network to handle 740-metre length trains, the Finish terminal goes a step further. “As soon as 2022, we will be able to facilitate trains with a length between 800 to 1,100 metres”, she said. With such a length, trains run straight up to the terminal area without any extra maneuvers conducted in the railyard.This will increase the capacity of the terminal significantly meeting market demand. “The volumes are growing, so we just need a larger terminal”, commented Aleksandra. Key in the expansion plans is the Kouvola RRT (Rail Road Terminal) project. This should turn the facility in a large-scale intermodal terminal, the largest in the Tehola-Kullasvaara area. This project was launched in 2015 and is now gaining momentum, as it has received considerable EU funding. “The terminal is designated by the EU Commission as the only TEN-T core network terminal in Finland. The project received EU funding and is now to be implemented”, Aleksandra said. The project requires an investment of 50 million Euros. Kouvala is located in the south-east of the country, nearby Helsinki (Finland) and St. Petersburg (Russia). A cargo train is on Russian territory within an hour and from there, it could take various routes to multiple locations in China, or even Japan. 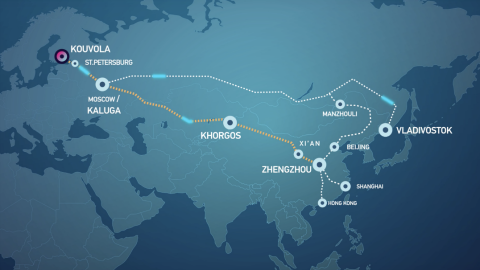 The route operational at the moment leads though Kazakhstan and terminates in Xi’an. This rail freight service is offered in both directions. “The reasons behind the success of this route lie in its competitive advantages and the fact that there has long been a demand for a route like this. 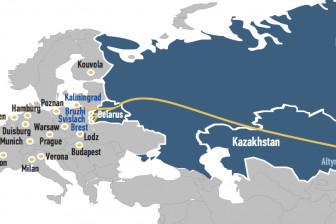 Compared to the other rail route connecting China and Europe that goes from China to Poland, the one running from Xian to Kouvola is shorter and the train only has to change track width once during the transportation, saving further time. This year’s RailFreight Summit is the second edition of the event, which will be held in Gdansk this year. On 15 and 16 May, top-level speakers will gather in this intermodal hub to discuss New Silk Road connections and other routes through Poland and Central Europe. Intermodal hubs and emerging markets are also among the themes. Registration is still open. More information about the event can be found on the website.